Two experts on alternative health offer their first step-by-step guide to meditation. The same ability that helps ordinary men and women achieve extraordinary success is also the secret to optimizing your life span, letting go of stress, and even enhancing your body's self-healing powers. In Meditation for Optimum Health, you will join bestselling authors Dr. Andrew Weil and Dr. Jon Kabat-Zinn for a practical introduction that makes it simple to enjoy the life-changing benefits of meditation ­ even if you've never tried it before. How does meditation work? Can anybody do it? What do I need to get started? Is it religious? Does it have the power to heal? 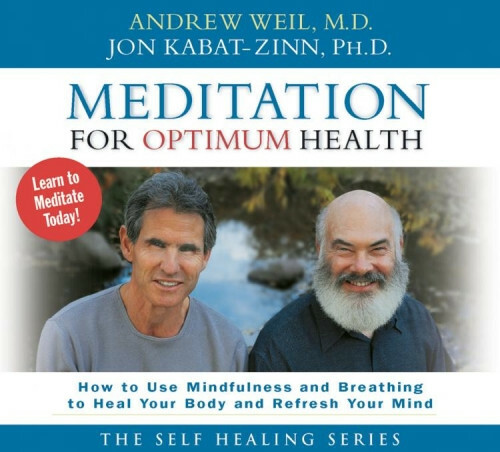 In alternating sessions, Dr. Weil and Dr. Kabat-Zinn give you straight answers to the most common questions about meditation, and dispel the myths and misconceptions surrounding this time-honored practice. By learning to cultivate the power of your attention through daily practice, you can harness the full potential of your mind, and use it to enrich every dimension of your life. You will learn how meditation can actually unify your mind and body's many related functions ­and help you start enjoying the best health of your life. Complete with real-life examples, and a proven program of step-by-step meditations to get you started, here is the perfect introduction to the oldest and most effective system for feeling better, naturally: Meditation for Optimum Health.